third time at lorenzo. cant fault it apart from no fridge in rooms and a/c is extra. oh and breakfast is very basic and never changes. very friendly , helpful staff. young girl in pool bar remembered my ugly mug from two yrs ago. clean basic rooms. had lovely room over looking pool and sea this year. enjoyed those sun sets. 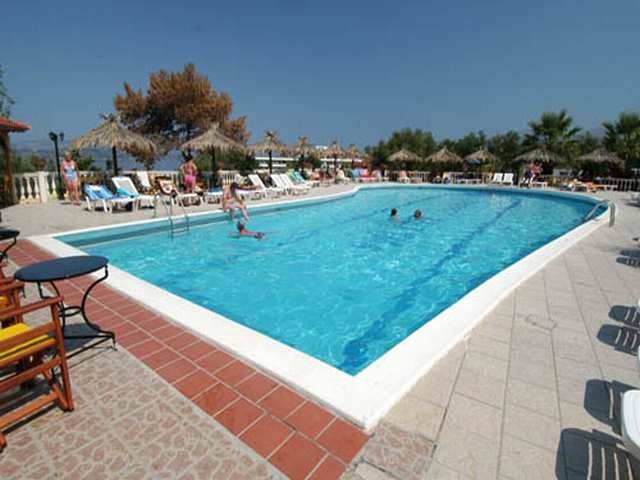 hotels set in a quite location, not far from main beaches and tavernas. avoid misery guts in the supermarket near the hotel, turn right and use the one on the bend, bout half a mile away very friendly staff. cant wait to return . Just got back yesterday (26th Sept) and we cannot fault the staff at the Lorenzo Hotel, room was cleaned everyday, yes it was basic - but when you are on holiday how long do you spend in your room ?? It was my birthday while i was there and i had a bottle of wine from the staff and, unknown to me my boyfriend had sent them a fax asking if they could arrange for some flowers to be delivered - and they had sorted this for him - i would would recommend this Hotel. We had a ground floor room facing the pool area and this is the the view we had. We are hoping to stay at the Lorenzo House Apartments and would like to know if anyone can tell me if they are located on the main road and if traffic noise was a problem, as my lady struggles sleeping with constant traffic noise as we experienced last year. Would appreciate any info. This was the view from our room, how can you say anything bad about that? Clean rooms and very friendly staff, thanks! Just got back from staying here. Staff were very friendly. Try to get a sea view room if staying here as the view is beautiful. Rooms were clean and basic, no fridge in the room but there are communal fridges in the bottom lobby to put what you need in it in a numbered bag. Sounds risky but we had no problems with it. Rooms have a/c but this costs 5 euros a day. The cocktail bar and tv lounge both have a/c. If your planning any excursions I would highly reccomend you got to Etam in the Main street as this is much cheaper than going through your holiday rep.
Just returned from a great holiday in the Lorenzo Hotel in Lassi June 2006. Excellent hotel, very clean, great situation in centre of resort, 2 mins from beach, very friendly staff. Don,t miss Makris Galios beach about 10 mins walk from the hotel, absolutely beautiful. For great food go to Pheadra's on main road. Lovely island, hire a car and go north. My partner and I have also booked to stay at the Lorenzzo at the end of June and wanted to know about the air conditioning? We are a family of 4 two boys aged 10 & 13 who are going to Hotel Lorenzoin June is it suitably quiet for a family or very noisy ? Has anyone stayed in the appartments for 4 peop;e and how do they fair? Thanks Fiona. We stayed at the Hotel Lorenzo from September 6th until September 20th, the staff were lovely all could speak good English, everywhere was clean we would go back to that hotel. Good place in Lassi for eating was San Lorenzo Restaurant good food and lovely staff. Just returned from two weeks at the Lorenzo hotel. The staff were very friendly and helpful and the cleaners do a good job of keeping the hotel spotless. Unfortunately the room (number 235) we stayed in was very noisy since it was situated next to the lift and the staircase and directly above the reception entrance, so there was a lot of noise from people coming back at night (up to 2am), talking, shouting, banging doors etc.We found this quite stressful and asked to be moved to a quieter room but was told that the hotel was fully booked. One other problem was that the water supply to the shower slowed down and stopped at peak time when everyone was showering (when people were preparing to go out for the evening). We were informed that this was normal, so took to showering much earlier. When entering the shower room & toilet, the door would not open properly but banged against the sink which was directly opposite the door. The plastic toilet seat was broken when we arrived but we did manage to get it put right the next day once we had spoken to the rep about the problem. We went on tours and boat trips with Etam Travel and found them to be good and cheaper than the ones arranged via the rep. 8 euros less each on one trip. Etam's tour guide for the trip was Esme - what a character, she was so interesting and told you everything you wanted or needed to know about the excursion. We found "Mythos" restaurant and "The Captain's Table" in Argastoli (near the square) to be two of the best, also "Tranta" in Lassi, all serving wonderful Swordfish etc.. Not forgetting "Premier" a well stocked cake and icecream cafe in the square at Argostoli. Would we go back to the Lorenzo again? we don't think so. I have just come back from Lassi in Kefalonia. I enjoyed the local cuisine. the friendly people and it was nice and quiet just what my husband and I enjoy. The hotel was clean and tidy and the staff very nice. the only fault I have is the room (236) you had to sit sideways on the toilet as the wash hand basin was too close to the toilet. The beaches around Lassi are excellant. Breakfast was what I liked yoghurt, honey, ham, cheese etc but unfortunately not if you liked a cooked english breakfast. The pool was fantastic. What more can I say, had a great time found a nice bakers shop in Agostoli, plenty of sunbathing and great hospitality. 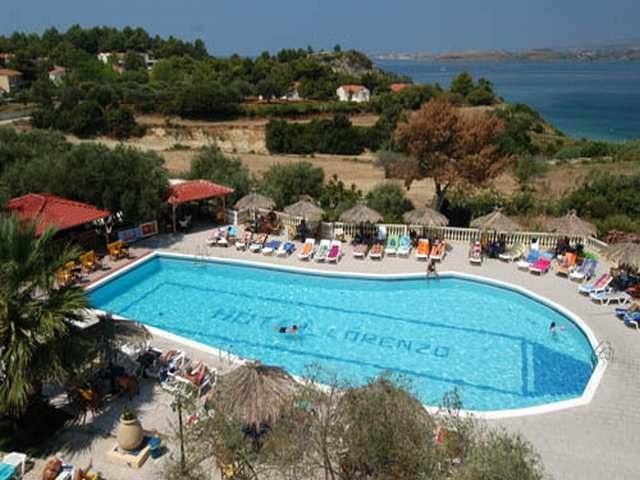 A fantastic holiday in Kefalonia at the Hotel Lorenzo. Just had a great holiday at this hotel. Rooms are fine - typically Greek, marble floors, basic furniture - and very clean. We thought the breakfast was good, but then we don't expect an "all you can shove down your throat" buffet in Greece. If you want a full cooked, go to Blackpool. Staff were very friendly. Didn't use the pool - too many good beaches within walking distance. The island is one of the most beautiful we have been to. Hire a car and explore. We went in August and the only crowded beach was Antisamos (the one where Captain Correlli was filmed). Can't understand all the fuss about Oskar,s, though. Food very average. I recommend going there once, just to witness the jaw dropping naffness of the "entertainment" - a bloke throwing a stick in the air and catching it; squirting lighter fuel on the floor,lghting it, rolling up his trousers and "dancing" in it! Surreal. Greek dancing is an aquired taste - most people look very uncomfortable and embarrassed to me. If you want good food, especially vegetarian, try Phadra's on the Lassi main drag. We have stayed in various hotels in Lassi over the last 14 years and although the Lorenzo is in a great position with excellent views and a good pool area we felt the accomodation was not to the standard you would expect with small rooms and even smaller balconies. The breakfast was tasteless and unimaginative. The cocktail bar was very expensive and the very pretty girl was very prone to giving short measures and overcharging. We say several arguments and in the end took to drinking elsewhere. We however felt the rest of the staff were friendly and will be returning to Lassi sometime as it is a good resort. Just got back an hour ago from our hoilday in kefalonia. This hotel was fantastic. The rooms were cleaned every day and nothing was to much trouble for the staff.The breakfastr was abit boring but not the end of the world. Excellent location and brilliant pool. Would highly recommned this hotel. Has anyone booked here direct with the hotel? Does anyone know if the apartments have full air-con? We returned last friday after a fantastic 2 weeks in Kefalonia. 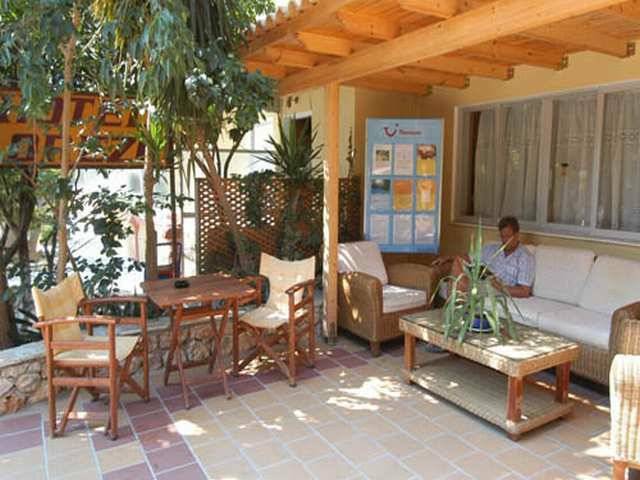 This hotel is ideally situated for exploring Lassi, the rest of the island, and is near to Argostoli the capital(Taxi 4-5 euros). It is also close to a number of beaches the best by far being Makris Gialos. Breakfast is a basic affair, and became a bit monotonous after a few days, if you don't like bread or Madeira cake then forget about it. We stayed in a hotel room which was cleaned daily, had air con(extra 6 euros per day), safety deposit box (10 euros per week) but alas no fridge, although there is a communal fridge available in the hotel. I'd recommend a studio or apartment. The sunset views are also excellent. My only faults about this hotel were firstly the attitude of the staff at the swimming pool, who I found to be a bit rude and not very friendly, someting I never have experienced in previous visits to the Greek islands. Secondly in my opinion there were also too many rules at the pool (i.e. no diving, no jumping, no glasses or bottles allowed around the pool, wash off sun creams before entering the pool, snack bar only open between 12-3.30pm..etc). Lastly we also found the bar a bit on the expensive side in the hotel. There is a weekly quiz night there, and music once or twice a week also. Not a very lively bar to be honest. Just come back from the best holiday ever! The Lorenzo was the perfect place for me and my partner to stay in. It was clean (rooms coleaned every day) and very comfortable. The pool was clean and fairly quiet - some families but not too many. The pool bar does great snacks and drinks and plays good music (not just noise!) all day. Breakfast not fantastic, but then again once you realise that the Greeks don't really do breakfast full stop it's fine. I'd definitely go here again!! i am 19 and i am going to stay in lassi for two weeks, i just wanted to know if it is a good place for people my age to go, are there good pubs and clubs around? We thought that the Hotel was lovely. Nothing was too much trouble for the staff and the rooms and communal areas were always spotlessly clean. We had a room on the first floor and the view was spectacular. The room, whilst fairly basic, was typically Greek with tiled floors and whitewashed walls. Due to the location of our room (right at the far end of the hotel) we thought it was really quiet. Be sure to check out the Atmosphere Bar between 10 & 11 o'clock when all cocktails are half price. We stayed in an apartment in the Lorenzo Hotel for 2 weeks in June 03. The apartment was very basic (2 bed bedroom, bathroom and front room with 2 bed settees, table & chairs, 2 ringed cooker, fridge, sink (no kettle)and we had to pay for the air-conditioning (86euro for 2 weeks) but served very well as a base. The hotel is spotless, with apartment cleaned every day. The pool/pool area is fab with a wonderful poolside bar serving a delicious menu at keen prices (club sandwich & chips 4-00euro). 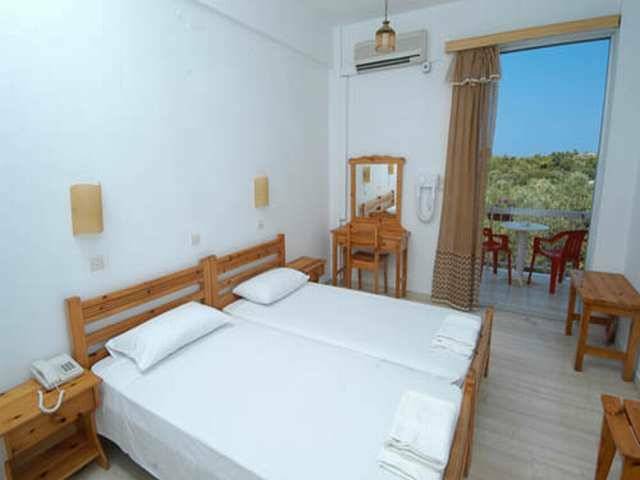 It is very central to the main area with all the tavernas & restaurants, and only a short walk to the nearby beach which can be viewed from the back balcony of the apartment (front outside terrace faces the main street which is approx 100yds away). Accommodation was B&B but, beware, the breakfast is only juice, tea/coffee with bread & marmalade/jam. The odd morning there were cold boiled eggs or ham!! The only other disappointment was the hotel bar.The bar at reception opened @ 6pm where you could take your drinks out to the veranda at the front of the hotel. However, this closed @ 9pm to allow for the "Atmosphere"bar to open.........Alas there was no atmosphere. There was music advertised for 2 nights a week but this consisted of a guy playing a piano (no singing).......music that should be heard in elevators. The hotel did try to run a quiz night, however the time was too early for people (9pm) as most people are out eating at that time. The staff are very friendly and most obliging especially Zoron who works the main bar. If there was a little bit more effort put into the hotel, it would definitely be the place to be i.e. fix and maintain the children's play area at the pool; get Sky sports in the Hotel; Liven up the "Atmosphere Bar" and/or leave the reception bar open later..........just a few thoughts. Overall, enjoyed our holiday immensely, and looking forward to going back again - a beautiful island. The hotel lorenzo has a lovely swimming pool, is close to main road, BUT we stayed may 2003 and found the rooms small and very basic. also you hear noise all day all night from banging doors to people flushing loos to people snoring. Every morning you get a tray shoved at you with tea and coffee, 2 pieces of bread with a sachet of jam, a piece of cake and in a 2 week stay 2 eggs and 2 bowls of cornflakes and 2 dishes of yoghurt and honey, Delicious i don,t think. And to top it all a sign saying "missing your english breakfast", than why don,t you buy one from the poolside bar for 6 euros. IF YOU GO TO THIS LOVELY ISLAND STAY IN A STUDIO APARTMENT FOR �200 PER COUPLE PER 2 WEEKS LESS THAN THIS HOTEL. Happy holidays. Is it possible to take a car over to Zante for the day form Argostoli any info would be appreciated. We stayed at the Lorenzo for 7 nights at the beginning of October. The room we had was basic but comfortable, unfortunately, we were situated right next to reception which gets noisy at times(expected really), so I would recommend you avoid room 115. Staff are friendly and the cleaners do a great job (couldn't get used to putting used toilet paper in a bin!). The Atmosphere Bar didn't seem to have any when we were there, but it was late in the season. Judging by the comments left by previous guests this can be quite a noisy hotel in high season.